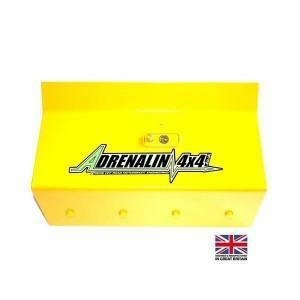 Adrenalin 4x4 heavy duty security pedal locks for all Defender models 1986 to 2016. The famous Adrenalin pedal locks are now more secure than ever. With new features such as adjustable slider for best possible fit, ultra-bright LED warning light and model specific design make the Adrenalin lock the one to have. Our Mk2 lock received a 5/5 security rating from LRO magazine back in spring 2011 issue. Not settling for average we went back to the drawing board and listened to user comments to further improve the design for our MK3 version. We are the original designers of this type of lock and we have constantly looked to improve our design throughout the years. Our new mk3 lock is without a doubt the best fitting and most secure pedal lock on the market. CAD designed, CNC cut and bent for best possible fit. Lighter and smaller than previous version. Incorporates a large hardened shutter lock, security rated 9 out of 10. The locks we manufacture are now model specific; we know it’s impossible for one design to fit every model perfectly so all our locks feature adjustable plates where applicable for the best possible fit. The locks feature an ultra-bright LED warning light that illuminates the cab at night to deter the thief before they damage the door lock and find the pedal lock. X2 Window warning decals also included. All our locks are shot blasted and powder coated bright yellow for finish durability and to acts as a good visual deterrent. Locks to brake pedal, right to left in motion. Adjustable fit, will require slider plate setting using a 13mm spanner (not supplied) on first fitment.